Trollstigen is a road through the nature of Western Norway with a dizzying view of sheer mountainsides, waterfalls, deep fjords and fertile valleys. You will find Geiranger-Trollstigen National Tourist Route is a 106-kilometre-long stretch of road located between Lake Langvatnet on Strynefjell and the Sogge Bridge in Romsdal in Fjord Norway. 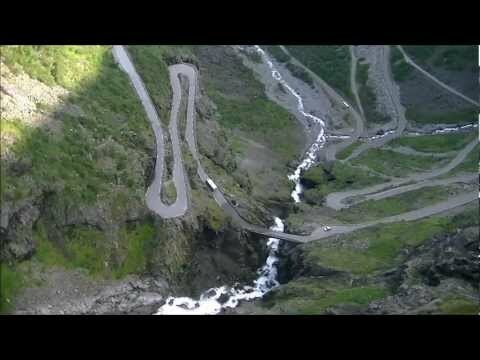 The Trollstigen Mountain Road has great viewing platforms to look down. The road has a steep incline of 9 percent and consists of 11 hairpin bends. Trollstigen has been a magnet for tourists since the road opened in 1936. On the ride up you will discover the road is carved into the mountain itself, and in other places built in stone. Highlights like Flydalsjuvet, Ørnesvingen and Gudbrandsjuvet are all popular viewing platforms. The highest mountain here is 1600 metres above sea level, and when you take the ride up to the highest point, it is 852 metres above sea level. A stop or stay by Juvet Landscape Hotel, a fantastic landscape hotel is recommendable. The hotel fit perfectly in here with nature and offering some unforgettable accommodations. When you look at the history, The Trollstigen Passage always has been important. The road was an important transport passage between the villages Valldal in Indre Sunnmøre and Åndalsnes in Romsdalen. For hikers, there is still a restored path to climb to experience Trollstigen by foot. Trollstigen is part of the National Tourist Route Trollstigen – Geiranger, and the road normally opens at the end of May and closes by October / November. The Geiranger Fjord is called "the jewel in the crown of the Norwegian fjords". It is one of the most dramatic and visited attractions in Norway.